You know you are falling apart when you strain your neck getting dressed. I am writing to all of you from my couch. I can't move my neck more than a couple millimeters in any direction. Damn hooded sweatshirts! My eyeballs are beginning to feel sore from doing all the work. The muffins I was planning to make will have to wait until tomorrow. I did want to tell you about a couple great kitchen utensils I love though. They are the Oxo Good Grips Medium Cookie Scoop and the Oxo Good Grips Large Cookie Scoop . The medium holds 1 1/2 tablespoons of cookie dough while the large holds 3 tablespoons. You get perfectly round, uniform cookies every time. The release lever means you don't have to use your fingers to get dough out. 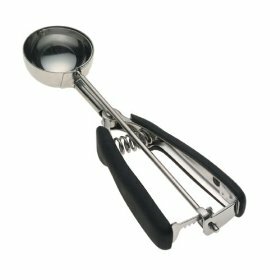 I have never used the large scoop for cookies yet but they hold the perfect amount of batter for muffins and cupcakes. The medium scoop is ideal for mini-muffins. They are also decent ice cream scoops. I use the medium scoop to make little ice cream balls sometimes. They look pretty cute. I'm hoping to wake up tomorrow with some neck movement. Not a great way to spend the first day of 2010. I'm thinking it can only get better from here though. Happy New Year! So sorry to hear about your neck! That is a huge bummer. I love using the scoops for cookie dough, too-- mine isn't as fancy with the rubber handles, so I might have to get on that! Hope you feel better soon! Nike Running’s annual Shield collection featuring water-resistant and extra reflective uppers is back again to take on this fall’s wet weather, and kobe bryant shoes it looks like the LunarEpic Flyknit is the newest model to get the treatment. Designed for those fall evening runs when it’s already dark by five o’clock, the LunarEpic Flyknit Shield features ample reflective threading intertwined into the nike free trainer 5.0 Flyknit upper with a water-resistant coating to keep your feet dry. Enjoy your first look at the new LunarEpic Shield, and expect them to arrive later this fall. Nike’s cult classic running model, the Nike Zoom Spiridon, kevin durant shoes got a boost thanks to a premium effort from NikeLab complete with luxurious mirror-like Swooshes followed by the return of some head-turning original colorways. Now Nike Sportswear is adding some modern amenities to the silhouette like a lighter Nike Air Max 2017 overall ride with the introduction of the updated Nike Spiridon Ultra.The Nike Zoom was one of the earliest running models to ever come equipped with Zoom Air. Pair that technological update with a sleek design complete with a Nike Factory Store breathable mesh and oversized Swoosh and it isn’t too hard to see why the shoe was such a standout back in 1997. Nike finally gave running purists the retro they deserved, but just in case you were looking Kobe shoes for something a bit lighter, NSW returns here with an updated outsole that rids the silhouette of some of its vintage weight.What do you think of the updated Nike Spiridon? Check out more detailed shots below and be Nike Air Max 2016 sure to head over to our release dates page for more of the latest sneakers headed to retailers.